Smart Strategies To Open Clickbank Account For Unaccepted Countries - BaseOnTechs - Learn To Do It Yourself. Opening a click bank account in Nigeria and other unaccepted countries has been a major problem for many. Actually, I used to be under this category until I arrived at the steps in this post. So you don't have to worry, in a short time, I will give you the smart strategies I used to open a Clickbank account in Nigeria and other countries. But before I go further, let me explain what Clickbank is, why you should create an account and other important things to note. Clickbank is an online market place which provides products and service to affiliate for promotion or direct sales. Clickbank brings a connection between vendors and affiliate marketers, in order to promote products and services to costumers who are interested. The vendor is the person who sells a product. In short, they are usually known are digital content creators in this case. Affiliate Marketers are those who help promotes products and services from Clickbank. So you and I can as well be a marketer. Like I explained earlier, it is a platform in between vendors and affiliate marketers. For example when I sign up to Clickbank, yeah I now have an account. It's now left for me to go ahead and select a product I had like to promote. I will then get the product, promote it, make sales and earn commission for every sale I make through my affiliate link. If you want to learn how to make sales faster and earn massively from Clickbank, you can hit me up privately or submit your email address below. I Send Awesome Tricks Like This To My Inner Circle For Free. To get Instant Access For Life. Should I Use Click Bank, Is it Safe? The big answer is Yes. In fact, Clickbank is amongst the leading online digital market. And it's highly recognized by thousands of people in the internet world and so far I haven't heard complains about frauds, payments, and scams, only that they seize to allow certain countries(e.g Nigeria) have an account. Anyways that will no longer be a problem after reading this post. Clickbank is free to use. Signing up or creating an account on Clickbank is free. You don't need to worry about later charges after signing up and as well you have full access to any product you want to promote for sale as long as you own an account. Each time you make a sale through your affiliate hop-link, Clickbank has 7.5% plus extra $1. Is it possible for me to be Clickbank affiliate? Yes, it is possible to be an affiliate. Once you sign up and get an account, kindly find a product you had like to promote for sale, get affiliate hop-link, promote a product, make sales and earn a commission. Also known as Grav serves as statistics of sales made by an affiliate. It shows and calculates the number of affiliates currently making sales by promoting a product from Clickbank. When there are more sales on certain products, Grav indicates such a product as well. Grav helps inform Clickbank users of a certain product with high competition. Maybe many affiliates are making sales through certain products, you will clearly see in statistics known as Grav. What Next? Is there any other thing you'd like to know about Clickbank? Let me know in the comment section. In a few seconds, I will put you through the smart strategies I used to open a Clickbank account successfully. Just be set to do some little things in order to get success in the process. First, there many ways on the internet to open Clickbank account in Nigeria and other excluded countries but here in the post, I have provided working tricks I have been using to open Clickbank account in Nigeria with ease. So do well to follow the below steps to get this done. Hola is a VPN software used to redirect or change the network IP address from the current country network to another of your choice. Believe you now know the power of the VPN. It will help you act like you are in the US or other countries accepted by Clickbank, while you get an account in your own country. It is now clear to you that without reading further, you've gotten the solution to your problem. But how do I use this app or software to work the way I want it? Let's immediately follow the below steps to open Clickbank account successfully with Hola VPN. Log on google.com type in Hola VPN Firefox Or Chrome depending on your browser type. Select the first option provided by Google to download hola VPN to your preferred browser. Click "Get Hola, Its Free" button. Now tick "Free" and click the "Install" button. Mind you, Subscription is a paid version of the app. Immediately you will see a pop up with a few details about hola VPN asking you to Save File or Cancel. Your file is saved. Now go to Downloads and install hola VPN to your preferred browser. Select Country you wish to act like. I selected Ghana as my country. You can as well choose any other country of your choice. Log on to Clickbank.com and click on the "Create Account" button at the top right corner of the page. Now check out your Hola VPN and make sure the country you select is active. You can always know if its active by looking at the top right corner of browser screen and hola VPN icon is changed to your preferred country Flag or logo. First Name. Use your real name. Last Name. Use your real name as well, It won,t affect payment form Clickbank. Street Address. To get a valid address, kindly open a new tab on your browser, log on to FakeAddressGenerator.com, click on "All Countries" located at the top right corner of page navigation and select preferred country. On next page is full details of a Ghana citizen, so it's either you copy details from there or generate new details with generate box. Apt/ Suite/ Other section. If you or your business has an Apartment, Suite or Other numbers, you can add the number here. If not, Skip this section, It's not necessary on Clickbank. Postal Code. Also known as zip code, you can copy the code from fakeAddressGenerator or go to Google, type in "preferred country" alongside "zip code"(e.g Ghana Zip Code). You will get a list of zip codes or just one, kindly copy and paste it in Postal code section. City. Copy and paste the city from FakeAddressGenerator. Phone Number. Copy and paste number here. Email Address. Type-in your email address. Payee Name. Your Full Name here. Bank Name. 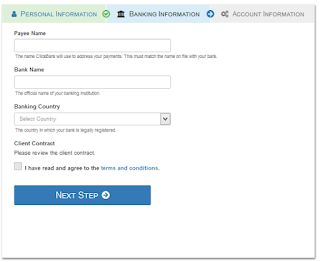 Name of the bank you use or any bank from the country you choose. Banking Country. Don,t worry select same country in Hola VPN. Read Terms and Conditions first then tick box, to show that you've read it. Here input your Account details, Username, and Password(follow instructions). You will need this in order to log in to your account. After that click Create Account. Your Clickbank Should be up and running now. Still not working, keep calm and follow more smart strategies. Epic browser is a browser that encourages safe and private browsing on the internet. The internet world has become widespread, so in order to keep safe and private our daily surfing, it is recommended that you use the epic browser. Not only that, the epic browser can help you secure your IP Address, Change IP Address and most important it doesn't take your personal data for granted. Now, this is why I choose the above browser for this tutorial. Trust me it will bring great results after use. For best result, recommend you create a new, fresh email address in order to activate and open Clickbank account. Also, you need an active Payoneer card to get success in the process. You can get one here. Log on to epicbrowser.com , Download and Install browser. After a successful installation, Launch browser. Now look at the top-right corner of epic proxy, you will see a kind of red angle facing each other known as EpicProxy. Click on it, turn ON the switch and tick the UK as your Country. Open a "New Tab", type in www.whoer.net on URL bar to visit the site. Once the site is opened, the location in details must be United Kingdom (GB) and if not, try turning OFF epicproxy, turn it ON again and reload browser. It should display now. Open Another Tab and log in the new Email Address you created Earlier. Select your country like the United Kingdom. At this point, FakeNameGenerator will bring forth full details of a citizen in England/Wales, Uk. Now you are to copy the necessary information you need to open your Clickbank account which is Street, Address, Postal Code, State, City, Phone Number, in case you need them in the future. Since you have gotten all require details, the next step it to open your Clickbank account with much ease... Yeah. Go to Clickbank.com sign up page. State. To get state correctly, kindly go to google, type in name of the city you generated from fakenamegenerator.com, and search. From there, click on that same city explained by Wikipedia. Email Address as the new Email Address you created earlier. 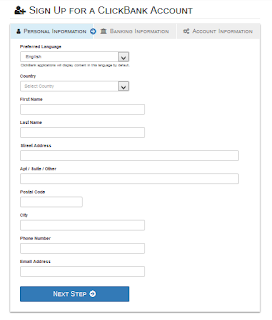 After filling the form, click the Next Step button. Finally, it's time to input your account details, i.e your login details. Add your New Password in "Password Field. Note that Clickbank requires a strong password for every account, so they recommend users password contains at least two(2) upper case letter, two(2) Lower case letters, two(2) Numbers, two(2) and Special characters(e.g MyPassword12@#). You can tick box to "Link Existing Account" with this one if you have any. Now click Continue to Proceed with your account creation. You will be asked to confirm your email address. Just log in your email account in a new tab on Epic browser, open Clickbank email, confirm and that's it. You've successfully created your Clickbank account yourself. Like Hola Vpn and Epic browser, Ghost VPN focus mainly on changing network IP Address. Browsing like you're in the UK/US while you still in Nigerian or other countries. You can possibly browse anonymously with this VPN as well. Kindly Download and Install Ghost VPN.exe | Download Here. After Downloading the software, Launch/open it. Click on "Surf Anonymously", the yellow option. Click on Start Anonymous Surfing, it will establish a new connection and your browser will open in a while. Now make sure the details on the website display Country as the United States or the United Kingdom. If so, you are good to go. Take a screenshot of the details given by whatismyipaddress.com for later use or type it somewhere. Go to Google.com in a new tab and search fake address for the details given at whatismyipaddress.com(e.g UK fake "City Name" Address) i.e For example UK fake "Dallas" Address. Alternatively, get fake address and details from FakaNameGenerator.com or FakeAddressGenerator.com. Now open the Clickbank signup page in new tab, make sure Ghost VPN is connected. Street Address, Postal Code, City, Phone Number from the fake address you generated from google or other sources earlier. To get state correctly, kindly go to google, type in name of the city you generated, and search. From there, click on that same city explained by Wikipedia. In short Type-in State displayed on whatismyipaddress.com. Email Address as your real Email Address, a new email address is preferable. In Bank Name section, go to google and search names of banks in your fake street name(e.g UK "State Name" Banks) i.e UK "Dallas" Banks. You will see a list of banks in that location. Just select any one of your choices. Now open terms and conditions in order to have access to tick box. Final Section which is ACCOUNT INFORMATION. Enter your preferred Username in "Nickname space". 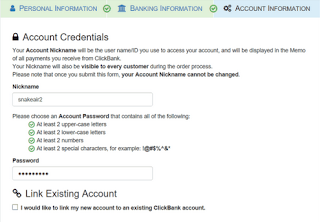 Will be required anytime you want to log in your Clickbank account. Then finally, your New Password. Password instruction is, you must make sure you use it contain 2 Upper case letters, 2 Lower case letters, 2 Numbers and 2 Special characters like in the screenshot below. It's highly required by Clickbank in order to get a really secure account. Click on Create Account. Clickbank may require email confirmation. Check email inbox and confirm. Immediately you will be redirected to the signup page where you will have to enter username and password in order to log in to Clickbank account. Boom!!! Success... Your account is ready. So by now, I believe you must have known really well the smart strategies to open Clickbank account. Starting from Hola VPN up to Epic browser and finally, Ghost VPN. Trust me, after so much work I came to notice that the methods above are best ways to successfully open Clickbank account in Nigeria and other unaccepted countries. And for sure, as soon as I discover new, updated and working strategies, I won't hesitate to share with you. Do well to submit your email address so you don't miss awesome tricks like this. I Share Free, Secret Tips & Tricks To Some Set Of Individuals. Do You Wish To Be Part?